Advertising | Vishal Mehra and Co.
Bridget Carey, from CNET was tweeting in ALL CAPS!! Taco Bell story? Some die-hards were flipping out! Like any self-respecting digital marketer, I figured I had to be on top of this recent development. So I went to Taco Bell’s twitter. Then to their Instagram feed. Then to their Facebook page. And finally to their Google+ page as well. This is a collection of what I saw. 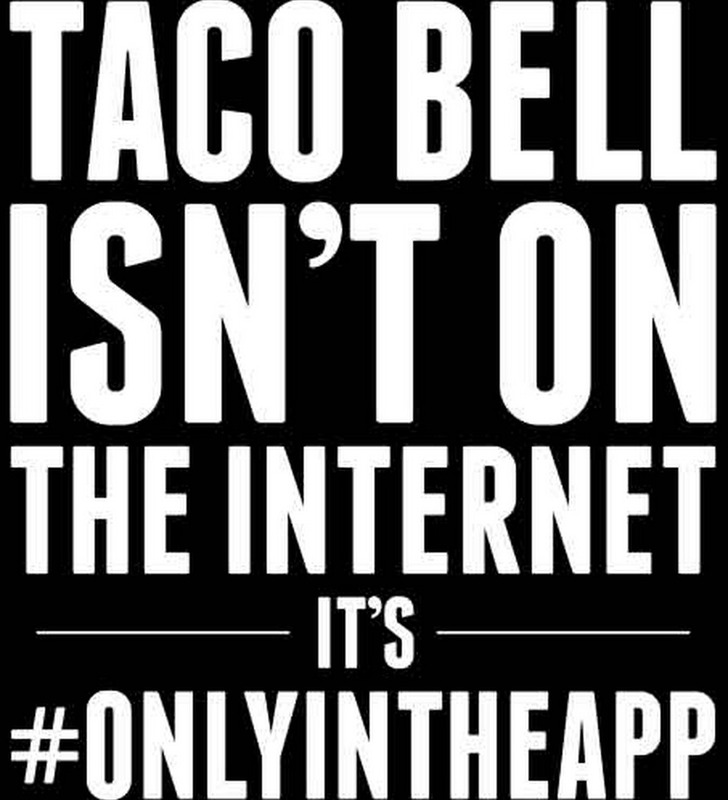 As it turned out, Taco Bell launched a new mobile app but rather than going on a social media frenzy, and buying up all possible hashtags, the digitally savvy brand did the exact opposite. It blacked out and went silent across all of their social presence channels. Even the website, which had products and corporate/brand information, wasn’t spared either to promote the new app. Content on the company’s Facebook was deleted and all images blacked out. 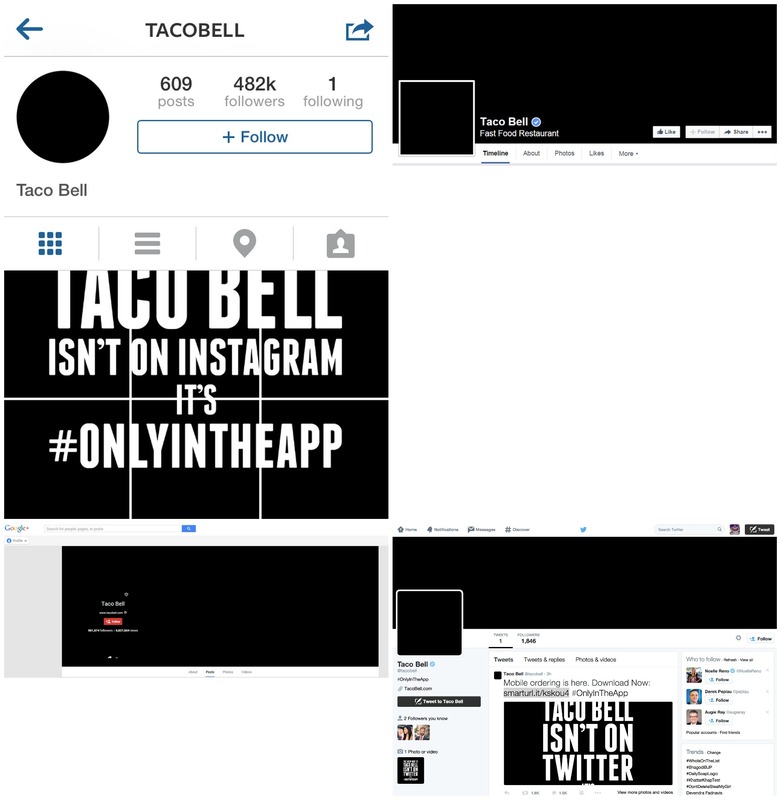 On Instagram, Taco Bell released a series of black and white text-based images with the hashtag #onlyintheapp. For a brand that has over 10 million fans on Facebook, this move can clearly be described as ballsy, one which most marketers will lose weeks of sleep over. Taco Bell, to the best of my knowledge, has done nothing of the above. This is obviously not to indicate that the above-mentioned methods are not effective. Thousands of apps employ those strategies every day, and do it with great success. 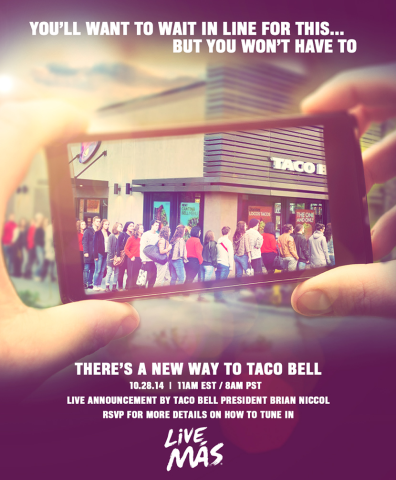 Taco Bell has done things differently while creating enormous amount of buzz and earned impressions. The App Annie chart below looks at the Taco Bell “Live Mas” app’s rank history over the past month, for Apple iOS. Notice the spike in the end. The chart shows that for the Food & Drink category, the app moved from its usual spot from around 60 to become number one for that category, in the US. Amazingly, It also became 24th most popular app in the US on the launch day. Next day, it climbed up to rank #22. The hour-by-hour report is even more incredible. It starts with the app ranked 1,379 overall in the US as of 2am PT, October 28. By 1pm — it had shot to become the 24th most popular app. The app is not yet listed on the iTunes most popular free apps chart as it is updated on a weekly basis. Besides the number of downloads, the post-download behaviour/interaction is vital. Everybody in the business knows that its easy to make users download apps, its far more tougher to make them use it everyday, every week, once every month or heck, even once after the first trial. It won’t be the brilliant promotion strategy that would make users come back, but the app itself, and the UX it offers. Taco Bell covered that with the option of ordering mobile app only products on the app. They are also offering mobile payment, which is apparently the first for the industry. Moreover, in stores, there will be a separate pick-up line for app orders. Taco Bell is known for its progressive and clever social media strategy, including being an early mover on Instagram, Snapchat, Vine, Tumblr, Pinterest, Hyperlapse among others. While it initially seemed like Taco Bell had completely wiped out its Twitter history, the account is actually hiding at @totallynothere during the blackout — with all followers (1.4 million) and tweets (39.9K) in place. It is also interesting to note how quickly Twitter acted to make the “new” Taco Bell account verified. Usually, when a verified account is renamed (which is exactly what Taco Bell’s agency Digitas did), it loses the verified status. Clearly twitter and Digitas were planning and working on this stunt together. For now, the experiment seems to be continuing though it may not be long before Taco Bell resets and retakes its old avatar. I, for one, miss the witty one-liners. See below for an epic example. It is heartening to see Taco Bell embrace technology like no one else, and at the same time, add emotions in the mix. Even the press invites sent for the announcement looked like something you wouldn’t expect from a fast food retailer. And that’s the trick. Taco Bell wanted to make sure that their message broke through, without breaking their budgets. As a pioneer marketer, Taco Bell prefers to do things that have never been done before, which fits perfectly with their brand as well as the demographic they cater to. Social media has been tightly entrenched in Taco Bell’s broad marketing play as well, with key personnel from PR, operations, product, and marketing playing a part in influencing the brand’s social movement. 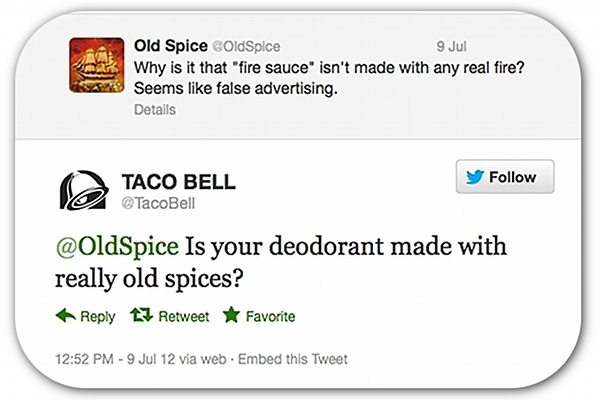 And for those, who believe social media leads to zero ROI, one look at Taco Bell would absolve that myth. AdAge recently wrote about the role of social media in year-on-year sales growth outpacing its competitors. I have written in the past about clever social media and real time marketing employed by brands but this easily surpasses all Dark dunks and funny tweet fights. What do you think? This article has also appeared on The Wall Blog.